Photo: Participants of the Zika TechCamp collaborate during a group activity. The U.S. Embassy to Barbados, the Eastern Caribbean, and the OECS, in collaboration with the Caribbean Public Health Agency (CARPHA), hosted a Zika TechCamp in Barbados. 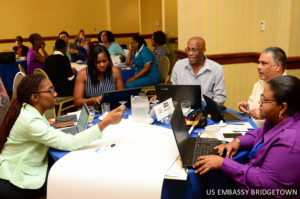 Sixty participants from the region with backgrounds in public health, media, and the private sector met at the Hilton Barbados Resort for the two-day event. An initiative of the United States Department of State, the Zika TechCamp is an innovative program that will assist the region in preventing the spread of emerging infectious diseases through the use of new media technologies. He added that the OECS Commission’s Health Unit would be seeking to deepen its engagement with its regional partners to address Zika and that the lessons learned from the tech camp would help manage communication relating to communicable diseases in the Caribbean.